With much gratitude, we would like to thank Top Level Fitness for hosting two charity workouts on October 28, 2017. 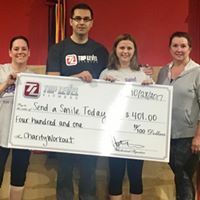 Top Level Fitness donated all proceeds from those two workouts to Send A Smile Today. A total of $411 was raised from the charity workouts. Top Level Fitness believes in giving back to the community and that #wecanchangelives. Top Level Fitness is located at 2764 Aurora Ave #120, Naperville, IL 60540. Click here to view the video from this workout.